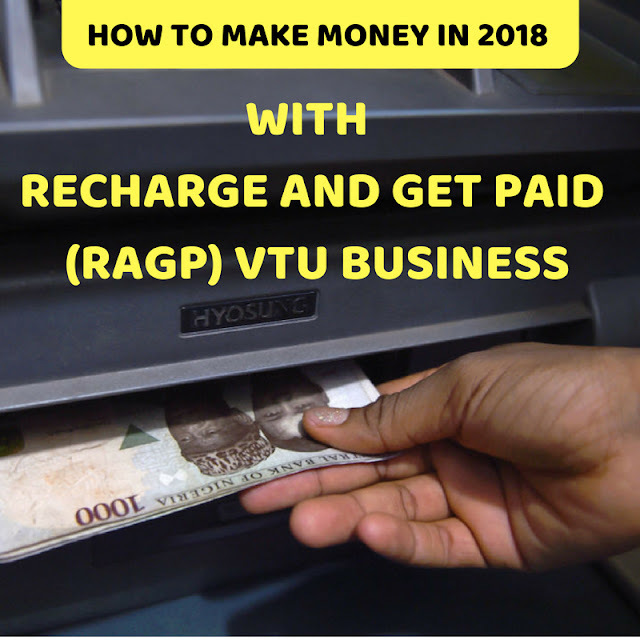 Recharge and get paid (RAGP) is a telecom business that allows its members to make 20,000 Naira or more daily through a combination of VTU Business and a Multi-level marketing business model. As a RAGP members you will start making money daily online like the banks do every time you Top up your airtime or do data subscription directly from your bank account. The RAGP is awesome and anybody looking for a passive source of extra income will find this business very rewarding. With a low startup cost of 5,000 Naira a new member can register on the recharge and get paid Network and start making money every minute with Mtn, Glo, 9Mobile, Airtel Airtime Purchases and Data Subscriptions, Dstv and Other Paytv Subscriptions, Electricity Bill and other Bill payments etc There are members that have made up to 4.5 Million Naira in 6months with RAGP VTU Business. RAGP is a product of Recharge and get Paid Ltd and it’s a registered company in Nigeria both with NCC and CAC. The RAGP ltd is in partnership with all major Networks like Mtn, Glo, 9Mobile, Airtel and Pay Tvs like Dstv, Startimes, Electricity Distribution Companies etc. Through the VTU business of RAGP, you can buy Airtime directly, do data subscription directly and Subscribe for Dstv, pay your PHCN Bill both prepaid and post paid etc. While doing this, you will have the opportunity earn certain commissions ranging from 10% to 0.36%. Not only that, you will earn 20% instant referral commission on every member you invite to the recharge and get paid network, 2% commission from every of your personal Airtime recharges from your RAGP VTU wallet and 10% commission on your personal data subscriptions. Your RAGP VTU Business will get more interesting when you start earning unbelievable commissions every time any of your downlines perform any transaction through their Recharge and get paid VTU Wallet. Just before we proceed to the next section on how to do recharge and get paid registration, I think we should see how recharge and get paid works. This will enable you to make an informed decision on whether to join the RAGP VTU business immediately or not. Why would you not join this Awesome Income Opportunity? Only if you don’t know or recognise the power of passive income yet! How Does recharge and Get Paid Works? Recharge and get paid is a web based VTU Business and you can buy Airtime, do Data subscription, Subscribe for Dstv etc directly from your VTU wallet. Recharge and Get paid doesn’t have a mobile App yet but the website is optimized for Mobile and it’s very responsive. You can do your recharge and get paid VTU Business right on your mobile phone without any hassle. 7. 1% indirect referral bonus from level 6 to level 10 members. The recharge and get paid has been designed in such a way that once you are able to build a network of downlines, you will start making money every minutes through personal recharges from your VTU Wallet and that of your downlines. Apart from the above commissions, there are other leadership bonus like cash gift of 100,000 Naira, Free Dubai Trip worth 500,000 naira, Car Bonus and House Bonus. Also there is an instant sign up bonus of 20% of whatever package you are buying or activating. Now let see the different packages you can start with on the recharge and get paid Network, then we quickly discuss how to do recharge and get paid registration. All these RAGP Packages comes with a instant Commission of 20% as a Signup bonus. How To Do Recharge and Get paid Registration. 4. Fill the form with your personal details, then fill login details by choosing your username and password, fill your bank details and select a package you will like to start with from the drop down menu. That is all about the recharge and get paid registration. In 2017, after doing the normal RAGP registration, you still need to do the VTU Wallet registration but after the 2018 upgrade of recharge and get paid website, you don’t need to do that anymore as your VTU Wallet is automatically integrated to your dashboard when you login. 1. Login to your account with your username and password, then the Checkout page will appear. Once your account is activated you will be able to login and start your Airtime purchases, data Subscription etc from your RAGP VTU Wallet. Thanks for reading this detailed registration guide of recharge and get paid. Have you tried this VTU Business? Use the comment box, let us know if it worked for you.